Devin Lawson of south St. Louis County works to dry out the boilers in the Wabash, Frisco and Pacific Railroad Association's 12-inch gauge steam engines. Volunteers spent weeks cleaning up mud and river water from the group's buildings, tracks, engines and machine shop. The machine shop is critical to making repairs and creating the parts for new projects for the engines at the Wabash, Frisco and Pacific Railroad Association. The volunteer crew at the Wabash, Frisco and Pacific Railroad Association in far west St. Louis County is back on track after it was almost derailed by severe floods along the Meramec River late last year. The ridable miniature railroad in Glencoe opens for the season this Sunday, the first time it will run for the public since the flooding. General manager Mike Lorrance said the ticket booth is revamped, the crew shack is cleaned, and the rails are cleared of debris. But he said picnic pavilions and a lot of electrical work sitll need to be replaced. "The effects of the flood are going to be around for quite a while for us to kind of bug out, but we're getting there," he said. Most importantly, after heavy repairs, three of the railroad's 12-inch gauge steam engines and its diesel engines are back online and ready to give rides. "We're ready to give the public some rides this year and we think it'll be successful," he said. "We hope they come out and support us with everything that's been going on." Lorrance said the volunteer crew worked for months to restore the operation and make sure it was ready for the season. "My hats off to all the guys because we've all come together on this and done everything we can to get it back so we're ready to go. It's a labor of love," Lorrance said. "Everybody pitches and we get it done." The railroad runs every Sunday through October. The first run of the two-mile trip along the Meramec River departs at 11 a.m., with trains leaving every 20 minutes. Our original story from March 25, 2016: The Wabash, Frisco and Pacific Railroad Association in far west St. Louis County has taken area families for a ride on their miniature train cars for decades, but severe flooding late last year threatened to derail the historic operation. For months, the group has been working hard to get back on track. The waters from the Meramec River flooded all seven of the association's buildings, from its crew shack to its storage buildings to its machine shop. Tickets and souveniers were soaked. Mud mucked up the tracks, and the rising river even uprooted a pavilion, while tossing picnic tables into the nearby creek. Worst of all, the water overtook the small, 12-inch gauge steam and diesel engines - the literal drivers of the whole railroad. Luckily, the passenger cars, where kids and adults alike sit for a turn around the tracks, were spared. The Wabash, Frisco and Pacific Railroad Association boasts both mini steam and diesel engines, which pull the passenger cars that have delighted adults and kids in the St. Louis area for decades. "It was really traumatic," said Mike Lorrance, the association's general manager, treasurer and head of buildings and grounds. "We live and die by the river when she decides she wants to come up." Lorrance, who said he has "railroading in my blood," has spent 25 years with the association building and restoring these small, historic engines, one of which dates back to 1907. But the railroad club predates him and many other longtime volunteers. It was started in the 1930s by a bunch of high school-aged train enthusiasts on a property by what's now Lambert Airport. After moving the operation to its current location in Glencoe (part of Wildwood) in 1961, the group installed tracks, added an old abandoned railroad right-of-way, and began offering rides to the public. Nowadays, the group operates on Sundays from May to October, with a particular attention to student and community groups - as well as birthday parties. Lorrance said Wabash, Frisco and Pacific is one of the few places the public can ride these small trains, since most are now in private collections - or in the trash heap. "A lot of these little steam engines could be just scrap if nobody cares about them," Lorrance said. "A lot of these things were built for amusement parks and drive-ins that don't exist anymore, so we think we're preserving some history, and also educating the public what steam engine railroading was." Rains since the flooding have helped wash away the thick mud left by the Meramec River across the Wabash, Frisco and Pacific Railroad Association's tracks. But after December's flood, the engines were covered in mud, and their boilers, soaked. "With steam engines, the biggest problem is getting mud into the boilers; it effects efficiency and how long they last," Lorrance said. "Boilers have insulation behind the metal over them; if it holds water in there, water will work against the metal of a boiler and cause pitting and eat away at the shell." The diesel engines and their gasoline motors didn't fair much better. Plus, a thick layer of dirt also covered most of the hundreds of the tools used to keep the Lilliputian locomotives running. "Meramec mud," said volunteer Church Weber, of High Ridge, as he and buddy Joe Meyer of St. Louis hand-cleaned each and every one. "The water was of course over the roof, so everything in here got wet. We'll get back to functional; it's just going to take a while to clean up this mess." The flood certainly wasn't the first the association has weathered; there have also been floods in 1993, 1994 and 2008, but this one might have been the worst. Days before the rains came and the river rose, Lorrance said the crew moved most of their equipment above the 40-foot flood level predicted by the National Weather Service. Mike Lorrance, who holds several titles including general manager with the Wabash, Frisco and Pacific Railroad Association, said he's learned a lesson about how the group will store its equipment for future floods. Then the weather service updated its prediction - to 46 feet. But by that point, roads into the railroad grounds were closed, and Lorrance said his team was out of luck to try to move anything higher. "It was like, 'Oh, god, why didn't we put it all up at the upper level?'" he said. "We learned lessons in '93, '94, and 2008. We learned a lesson this year." Lorrance said next time, the group will move all equipment to the highest level of its tracks, where it is planning an expansion. But not all volunteers have Lorrance's experience and perspective. One of the association's younger members, Devin Lawson of south St. Louis County had expected to spend the railroad's off-season working on projects. The crew acquires and restores roached engines to working order to add to the fleet and also builds its own side frames and passenger cars. Instead of doing any of that, Lawson spent hours helping dry out and reinsulate the boilers, repaint the trains and generally work to mobilize the trains again. "It's a little scary," he said. "We've never had this happen in my experience of being out here. Usually we can continue working on a project and not worry about if it's going to run or not. You have your faithful engine, and now you're kind of like, it's a big question mark." Another big question mark was how long it would take the association to get its much-needed machine shop back up and running. The shop's mills and lays are critical for producing the bushings, bearings and other items needed for repairs and projects. Flooding damaged and rusted the machines the organization needs to make repairs to its trains, making it a high priority to get back up and running. In this case, the machine shop was critical for putting the railroad back together post-flood. But head of shop Bob Hart managed fairly quickly to get a vertical milling machine known as a Bridgeport up and running again with some oil and a turn of a wrench. "We got to get all the riverwater out of the gear boxes," he said. "Some were stuck from the rust." With the machine shop back in business and the boilers dried out, Lorrance said he is confident the railroad will be ready for opening day the first Sunday in May, even if only a couple engines are running. These unexpected repairs for the tiny trains have been costly, so the group has created a GoFundMe campaign to solicit donations. But Lorrance said he knows what will really be the ticket to the group's continued success. "The biggest thing that we would like the public to do is just come out and ride us in May," he said. "It gives support to us and shows support of what we're doing. St. Louis should be proud in what it has in this little railroad." If you rumble up to the top of Blackburn Park, you’ll get a picturesque view of the city of Pacific. You’ll see rows of tidy houses and retail shops settled beside gently rolling hills. At the center of it all is a sturdy brick structure shipped to the 7,000-person city at the conclusion of the 1904 World’s Fair: the McHugh-Dailey Building. Monday is the last day Missourians affected by the mid-winter floods can apply for federal aid. 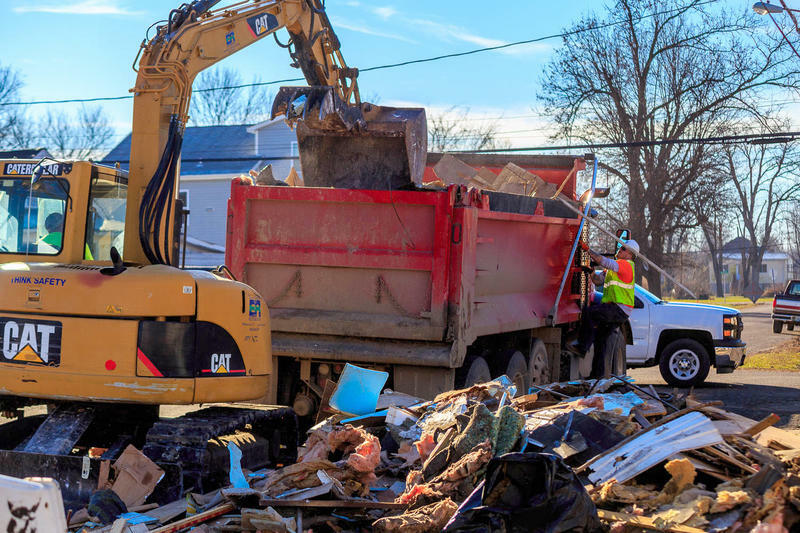 According to Federal Emergency Management Administration spokesperson, John Mills, FEMA teams have canvassed all the neighborhoods known to have been impacted by the floods and handed out application instructions in English and Spanish.